Spartans FC 14s impressed in the Willie Bauld Memorial Trophy as they finished 11-4 winners over Craigroyston BC 14s. Kyle Dempster got Spartans off the mark, only for Craigie’s Gary Lee to fire in an immediate reply. Then, Robbie Walker showed tenacity in the box to once again put Spartans ahead before playing an instrumental part in their third goal which took a final touch off Craigie’s Lewis Hunter. After the interval, striker Reece Mason showed clinical finishing in the box to score goals four and five for his side, with Craigie adding another through Tyler McKinlay’s neat finish one on one. Craigie were still battling, but Spartans upped their tally to nine through two Nicholas Reid strikes, as well as another goal a-piece for Mason and Reuben Walsh to put the game out of reach. Although McKinlay and Ryan Adamson upped Craigie’s tally to four, Mason again picked his spot from close range and Chris Pearson rounded off the scoring late on to wrap up a dominant performance from the home side. 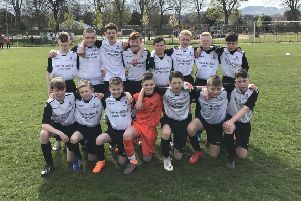 • Leith Athletic Colts 15s climbed the Division 3 table as they produced a 4-1 win over Salvesen CFC 15s at Forrester High School. Athletic went ahead when Robbie McDonald nodded in from a corner with 35 minutes on the clock. The sides were proving difficult to separate in the opening 40 minutes, but after the break Athletic broke the Salvesen resistance to grab two more goals in quick succession. Ben Hoskin chased onto a through pass before finishing neatly into the bottom left corner. Then, shortly after, Lewis Walls diverted a corner in with his head to make it 3-0 and put Athletic out of sight. A mix-up in the box allowed Salvesen to pull a goal back through Matthew Tait’s instinctive finish but in the end there was only going to be one winner. Athletic’s Cameron McLeod struck a stinging 30-yard free-kick into the top corner. • Spartans FC Reds 17s secured another cup final date with an impressive 4-0 win in the South East Region Cup semi-finals over Broxburn Athletic Colts United 17s. Having already booked a spot in the Craig Gowans Memorial Cup final, Spartans got their reward for perseverance just before the break. Right back Ryan Farrell interchanged passes with Cameron Dawson before cracking the ball homr. After the break, Mark Mackay took advantage of some slack defending to turn the ball in at the back post from a corner and then Lewis Hall picked his spot from just outside the box. To put the icing on the cake late on, Mackay doubled his tally with a sublime finish.